I’m one of those guys whose considered “driven” — which means that I have been guilty at certain points in my life of prioritizing work ahead of family. One experience which really changed all that was living in the Philippines. The Filipinos have a very wise culture, and I was always struck by the way that the elders in the Philippines seemed to be at peace with themselves in a way that we find elusive in America. I am an American – make no doubt about that – but the Philippines is my second home and a place that will always be close to my heart. Anyway — meet the family! 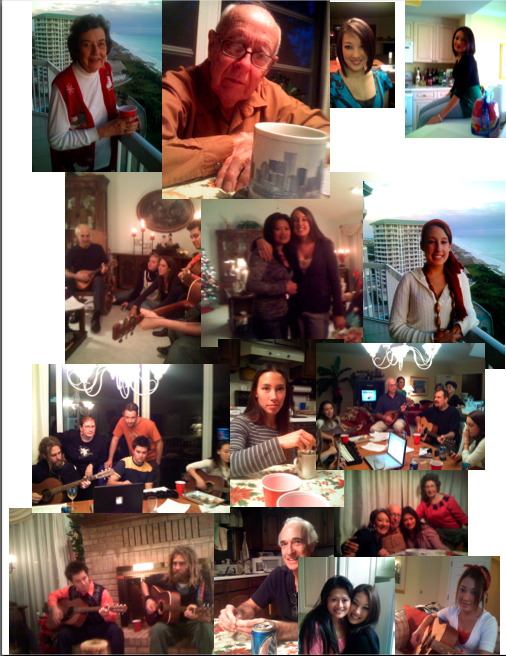 These are all pix from this past Christmas when we had a big family gathering in Florida. Below on the left — that’s my mom, just turning 80. Then, to the right, Uncle Arthur, 92 and still going strong. I took the pic this way because he’s had the same mug and sat at the same table since I was 5. Then it’s Michelle, my daugher, 17. The rest are ID’d at the bottom. Okay. Second row is a bunch of them wailing on guitars in the first picture — r-l Patrick, my son, is almost visible, then there’s Toren, his cousin, and Toren’s dad (my cousin) Curt. Next to that — moving right — is Rena, my wife, with Kaitlyn, my 19 year old daughter. That’s Kaitlyn on the balcony in the next pic to the right. She’s a freshman at Florida State. Next row: More guitar playing. L-R , that’s Patrick (son), Valerie (sister), Toren (nephew – sitting playing xylophone), and Regan, (nephew)…and then just barely in the pic, Tessa, niece, also playing guitar. That’s Tessa in the closup just to the right. And the one to the right is all of us, including me, playing and singing. Over my shoulder is Gin, Curt’s wife (my cousin in law), and ex-wife Lucy (we all get along!)…. Last row: Toren and Patrick, then Curt, then Rena and Michelle, and finally Michelle on guitar. Whew…that’s us. Yes, we like to make music. Not always beautifully, but enthusiastically. And sometimes, especially at Christmas, it really is beautiful.